Help Your Production Print Customers Boost Productivity and Reduce Cost | Industry Analysts, Inc.
No matter how jobs arrive or where they need to go, QDirect makes it happen. QDirect from Rochester Software Associates controls and automates workflows, routes jobs, and manages output across the entire enterprise. 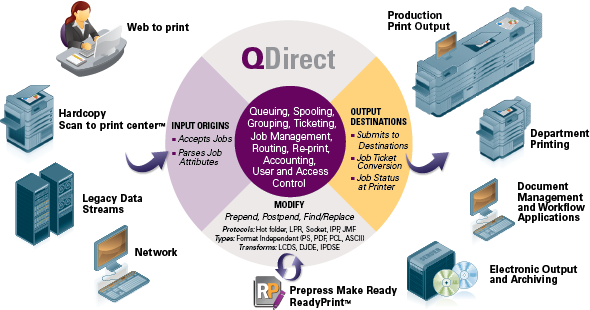 Consolidate printing and maximize equipment utilization with QDirect. QDirect accepts jobs from any source, including the network, mainframes, hot folders, and other RSA applications such as WebCRD and M.I.S. Print. Centrally manage and route print jobs to a wide range of destinations, including production printers, the fleet, archival systems, email, or submit into an external prepress and workflow application. This entry was posted in Rochester Software Associates and tagged MIS Print, production print, QDirect, rochester software associates, Software. WebCRD, workflow by IA Staff. Bookmark the permalink.